As a small business owner, you’ve become increasingly aware of the need for an online presence in today’s modern digital era. We’ve found that today, most small businesses have a website, blog, or possibly a social media page such as Facebook, however few know of or have allocated SEO (Search Engine Optimization) into their marketing budget. Every single month, Google receives hundreds of billions of searches. Over 90% of links (businesses) clicked are on the first page of search results. This alone should convince you of the importance of SEO in today’s moving market. In addition, Google changes its algorithms on a daily basis, so it’s even more important to hire an SEO firm that is Google certified and up to date on the fast-moving SEO industry trends. First off, you won’t reach the top page of Google if you hire a company that utilizes old techniques to increase optimization, as Google now punishes such endeavors. For instance, in 2016 Google made a push for mobile-friendly websites. If your website is not compatible with mobile devices, your ranking went down considerably. In 2017, Google turned their notice to voice search software and home devices such as Alexa and Siri as a way to successfully market to the modern consumer. Many small, especially local businesses benefitted by participating in the voice search, home device movement. 2018 proves to be yet another year of changes and there are some exciting new trends occurring. We’ve put together the top four developments you should keep in mind for your future small business marketing SEO goals. This trend has been tried and true in ranking on the first page, especially after Google announced that it now changes its algorithm over 500 times per year! What does this mean? This translates to Google doing a sweep of sites and indexing them in accordance to what they believe to be new and relevant to the modern consumer. For instance, let’s say you temporarily hire an SEO company in good standing and they get you on the first page for many of the keywords your customers are typing into their devices. Their efforts will only work for a short period of time, for the moment Google updates their algorithm, your business will be replaced by a competitor that is paying to keep up with the 500+ changes Google implements each year. This brings us to the importance of updating your content. According to Andrey Lipattsev, Search Quality Senior Strategist at Google Ireland, the two most important factors in how your site ranks among search results are “content and links pointing to your site.” Your small business site needs expert, highly key-worded, relevant written content and images to stay above the competition. If your SEO strategists produce well-written and attractively structured content, your overall relevance and engagement to the modern consumer (and Google) goes up. The longer a customer stays on your site, the lower your bounce rate, which will improve your search engine ranking. If your website runs off a platform like WordPress, installing an SEO plug-in like Yoast will help you instantly tidy up all your website content. User experience (also known as UX) was a major ranking factor in as early as 2010. Since then, Google has increased the importance of website upload speed in their algorithm. What does this mean for your site? If your small business site fails to load in under 6 seconds, your ranking on popular search engines such as Google will plummet. Simply put, customers looking for information are not going to stick around of your site takes forever to load. They’re going to leave and click on your competitor’s site instead. This increases your bounce rate and therefore decreases your search engine ranking. A trained SEO specialist will apply a variety of on and off-site techniques such as minimizing URL redirects, and uploading condensed files to speed up your site. There are several ways to speed up the load time on your site, which are crucial to keeping you above your competition. If content and backlinks are the two most important factors in SEO, RankBrain is fast becoming the third most important factor. RankBrain is an algorithm learning artificial intelligence system, the use of which was confirmed by Google on October 26, 2015. According to Jack Clark of Bloomburg Business, “It helps Google to process search results and provides more relevant search results for users.” In a 2015 interview, Google commented that RankBrain was the third most important factor in the ranking their algorithm along with links and content. During that year, the RankBrain algorithm accounted for 15% of all Google searches, in less than one year the figure rose to 100%. RankBrain uses machine learning to calculate the relevancy of online content and even though Google has stated that RankBrain is something that cannot be optimized for, it shows a preference for well written content that users spend a long time reading. 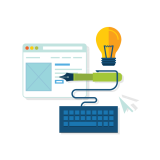 Therefore, instead of optimizing directly for RankBrain, optimize your site content for users and the ranking will follow. Over the last ten years, many studies have determined that people (consumers) are reading less and less, and instead relying on visual media to make their buying decisions. From the beginning of human history to 2011, and estimated 3.8 trillion photos were taken, whereas over one trillion photos were taken in 2015 alone. Social media plays a big role in this, as more than 60% of digital impressions and ads are driven by images. In 2018, having a visually friendly website and social media presence is key toward staying above your competition. Just this year, Google has made improvements to visual search with the creation and release of apps like Google Lens. Google Lens is an image recognition mobile app that is designed to bring up relevant information using visual analysis. “The ‘future of search’ uses your phone’s camera to identify objects and then gives you information about those objects. It provides a real-time reverse image-lookup, or, if you prefer, an augmented reality” (AR-Google). For instance, if you are out on a walk and you see a business you are interested in, you can point a Google Lens at it to pull up relevant search data about the business without any manual input on your behalf. Does your small business have an integrated marketing strategy? Are you unsure of how to best deploy your resources? Take advantage of our FREE SEO Audit! Call @ 866-417-8324 or email us @ info@mainstreetmarketingllc.com today, and one of our digital marketing experts will help you assess and improve your current digital marketing plan.